According to recent data, 89 percent of mobile time is spent in apps as opposed to mobile websites. This data is haunting to realize that so many companies are focusing their marketing efforts on mobile websites or even other marketing techniques such as TV ads or billboards. Although off-line advertisements still serve a purpose in the world it's important to realize that your mobile app is the most important weapon in your marketing arsenal. The only problem is that you have to actually Promote your Mobile App in order to get people to use it. Let's take a look at five ways you can build your mobile app with tools provided directly from your iBuildApp dashboard. To start off, go to your iBuildApp Dashboard and click on the Promote option so that you can see the various ways to share your mobile app with the world. What better place to start promoting your mobile app than with your social media accounts? If you have a Facebook, Twitter or LinkedIn account then the iBuildApp dashboard integrates directly with these platforms. Simply click on one of these buttons to share your new app with your current list of followers. You can also email the app to all your friends and family members or anyone else who might spread the word. What are the chances that your customers download your mobile app if you only put a link to the app on your website? Wouldn't it be better if they saw an actual preview of your mobile app? With iBuildApp you can share a preview with a simple copy and paste. Grab the code and show people what they're missing within seconds. This feature is great because it includes a link to the app so that people can grab it themselves. QR codes are the easiest way to merge offline and online marketing tactics for your app. After you develop your app you can generate a QR code that can be printed out or published on just about any type of document. That way if someone walks up to a magazine ad that you have they can take out their phone scan the code and it will automatically download your app on their device. Many companies also put QR codes on their websites so customers can scan the code and navigate directly to the download page. Not everyone is an expert at graphic design and coding. Wouldn't it be nice if you could create a beautiful banner ad to put on your website that promotes your mobile app whenever someone lands on your homepage? We understand that not everyone will want to design this. That's why we include an automatic ad generator for you to promote your app. 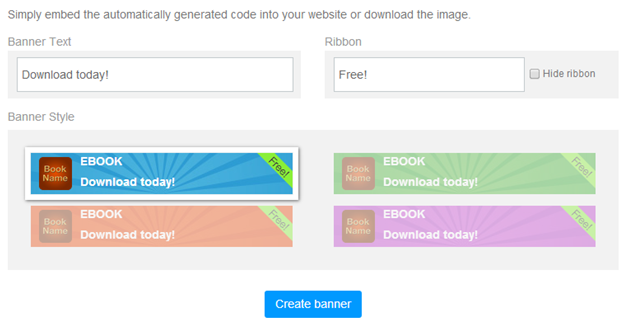 Simply type in your text, copy the code and put it on your site. The banner ad displays the name of your app, and you have a chance to modify a small ribbon in case you have something that needs to stand out. Landing pages are known to improve click through rates, so why not have one for your mobile app? With iBuildApp you can create a beautiful landing page within seconds Promote your Mobile App. 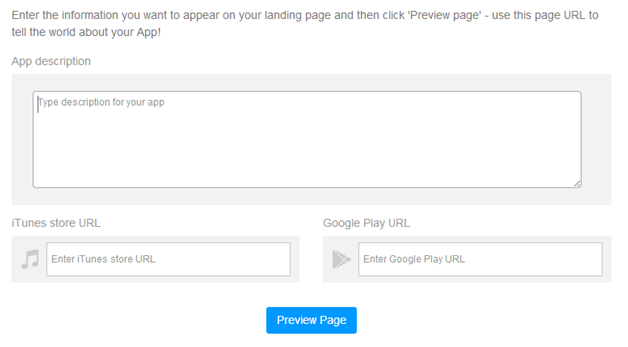 The landing pages include download links, social sharing buttons and text to explain what your app does. This feature actually integrates many of the other promotional features that are included in the iBuildApp dashboard. Along with sharing buttons you also include an instantly generated QR code in case people want to scan their screen when viewing it on a desktop. The landing page works nicely on mobile devices such as tablets and phones along with regular computers. It provides people a full app preview so they can see exactly what they will be downloading if they choose to. Share your thoughts in the comments section below, and let us know if you can think of other features that we can add to the iBuildApp dashboard to help you promote your mobile app. Drop us a line if you have used any of these current features and let us know how they work. We are always looking for feedback on our products to Promote your Mobile App.